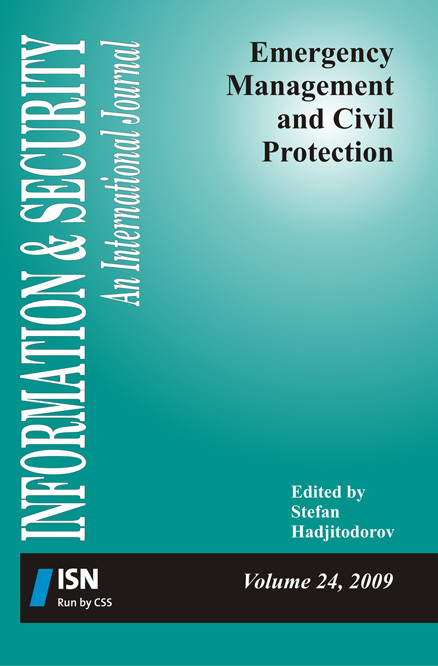 This volume provides a comprehensive overview of requirements definition, approaches and methods for assessing threats and hazards, strategy development and planning of capabilities for emergency management and civil protection (and more broadly, for security sector transformation), as well as approaches to preparing the population and the healthcare system for cases of radiation accidents and nuclear terrorism and analysis of reasons for incidents with radioactive sources and preventive measures. Editorial. "Needs and Opportunities for Enhancing the Emergency Management System." Information & Security: An International Journal 24 (2009): 5-6. Chakarov, Angel. "Welcoming Address." Information & Security: An International Journal 24 (2009): 9-10. Ivanov, Andrey. "Organization and Immediate Challenges of Civil Protection in Bulgaria." Information & Security: An International Journal 24 (2009): 11-13. Palazov, Atanas, and Hristo Stanchev. "Risks for the Population along the Bulgarian Black Sea Coast from Flooding Caused by Extreme Rise of Sea Level." Information & Security: An International Journal 24 (2009): 65-75.